The Economist has a post on an innovative form of recycling cardboard - Re-cycling. THE first bicycles were made of wood. Cycle manufacturers then switched to steel tubes. These days, for high-end bikes where weight is at a premium, they use aluminium alloys or even carbon fibre. But Izhar Gafni, an amateur cyclist who owns a number of such fancy bikes, wonders whether the original inventors had a point. He proposes to go back to using wood—or, rather, a derivative of wood, namely cardboard. Mr Gafni, who is based in Ahituv, Israel, spent years trying to work out how to make a cardboard bicycle able to support the weight of a human being. The trick is twofold. First, he folds the cardboard—commercial-grade material, made from recycled paper—to increase its strength. (He worked out the exact pattern of folding for each of the machine’s components using the principles of origami.) Then, once it is folded, he treats the result with a proprietary resin that holds it in shape and stiffens it, before cutting it into the form of the component required. A second application of resin renders the component waterproof, and a lick of lacquer makes it look good. The result, Mr Gafni claims, is stronger than carbon fibre. 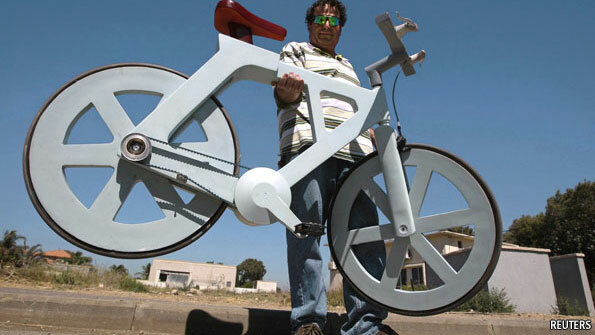 The bike’s frame, wheels, handlebars and saddle are all made of cardboard in this way, and then fitted together. The tyres—again harking back to the early days of cycling—are composed of solid rubber, which is recycled from old car tyres. That makes the ride a little harder than if the tyres were pneumatic, but means they cannot be punctured. The chain, based on the timing belt of a car, is also made from car-tyre rubber. The pedals are plastic recycled from bottles and the brakes are recycled too, though Mr Gafni is not yet ready to disclose the details. The finished product weighs 9kg, a bit less than an ordinary bike, and can carry a rider weighing 220kg. Mr Gafni’s target market is the poorer countries of the world. Because manufacturing the cardboard bike will, he reckons, cost $9-12 a unit, his design is far more affordable than a steel-framed bike.